2019 NCR Millona R. Picture credits - NCR. Submit more pictures. MILLONA aims at a specific market niche. It is meant for those who can appreciate a unicum, a high-class article, for those who love owning art or particularly precious watches, but most of all it is meant for those who share a passion for mechanic and technique in their purest form, for race lovers who get on the track to race like their idols, who have Ducati and the �desmo� in their DNA: they are the Ducatisti. 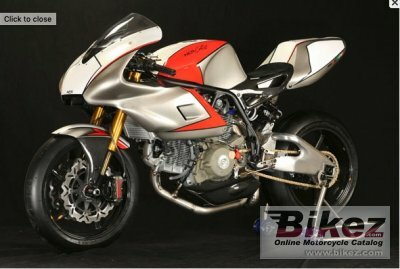 MILLONA is the ideal bike to win on the track, to accompany you for a whole racing season, to obtain surprising results, but mostly to feel the sheer pleasure of driving it and the prestige of owning the undisputed best in the two-valves class. Each MILLONA is entirely hand built, by NCR technicians, with utmost attention and care for the smallest detail and particular. Each bike is numbered. Engine details: Ducati 1000DS engine. Fuel system: Injection. EFI Magneti Marelli, 45mm throttle bodies. Rear suspension: Progressive linkage with fully adjustable Ohlins monoshock with lenght adjustment. seted up by NCR CORSE. Wheels: Forged Magnesium wheels. Metzeler Racetec Slick K0 tyres. Color options: Carbon fiber look with transparent paint. Comments: Fuel tank, subframe, fearing kit, belly pan, front mud-guard, seat tail and airbox kit in carbon fiber. Bolts and fastners in Titainum. Ask questions Join the 19 NCR Millona R discussion group or the general NCR discussion group. Enter your e-mail to join the 2019 NCR Millona R forum and get notification of answers and new messages about this bike. You can unsubscribe with a single click. Bikez does not display, sell	or misuse e-mail addresses. Bikez.biz has an efficient motorcycle classifieds. Ads are free. Click here to sell a used 2019 NCR Millona R or advertise any other MC for sale. You can list all 2019 NCR Millona R available and also sign up for e-mail notification when such bikes are advertised in the future. Bikez has a high number of users looking for used bikes. Before you buy this bike, you should view the list of related motorbikes Compare technical specs. Look at photos. And check out the rating of the bike's engine performance, repair costs, etc.